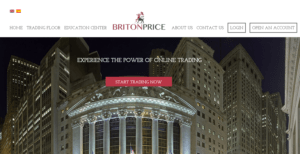 Britonprice Review 2018 | Is Britonprice a Scam or Legit Forex Broker? Beware Britonprice is a Non-Regulated broker. It is NOT SAFE to trade. We recommend you to avoid not licensed brokers and choose among the regulated ones. The most reliable regulators are the UK’s FCA, the Australian Securities and Investments Commission (ASIC) or the Cyprus Securities and Exchange Commission (CySEC). These regulators require a certain amount of capital from the brokers to guarantee the compensation of funds and a certain level of safety of clients’ money. Here you can check the list of the ASIC-regulated brokers.